Manila, Philippines - The Department of Education (DepEd) is now studying the 4-day school week proposed by the Metropolitan Manila Development Authority (MMDA), Malacanang Palace announced on Saturday, February 15, 2014. Deputy presidential spokesperson Abigail Valte released the statement on state-run dzRB Radyo ng Bayan in reaction to reports that the proposal has received negative reactions from the public. MMDA Chairman Francis Tolentino proposed the 4-day school week to the DepEd to prevent traffic volume from increasing as two major infrastructure projects are scheduled to begin construction on Monday. 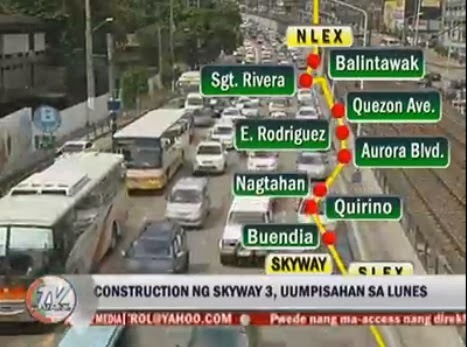 The two infrastructure projects which will begin construction on Monday are the Skyway 3 project and the NAIA (Ninoy Aquino International Airport) Expressway Phase 2. The construction of the Skyway 3, which will connect the North Luzon Expressway (NLEX) with South Luzon Expressway (SLEX). According to MMDA, the average speed of 30 kilometers per hour along major roads in Manila could be cut in half because of heavy traffic. This means motorists and commuters will have to spend more time on the road just to get to their destinations. Around 23 schools in Metro Manila will be affected by the road projects, the MMDA said. "This is a construction of massive proportion that would last 32 months. Building this alternative highway is expected to create traffic problems so everyone should make adjustments," the MMDA chairman said. "What we need is extra huge amount of patience and understanding and cooperation but once Skyway 3 is completed, it will result to faster and more convenient travel within the metropolis," Tolentino added. Tolentino also made a similar proposal for a four-day work week to the Department of Labor and Employment (DOLE).